Placid waters and soft white sand are what this beach is known for. Out of the city crowd, this lovely small beach is quiet and peaceful. Unlike Tobacco Bay which is located at a short distance away, this beach is not crowded. St. Catherine's beach is located at the North Eastern end of St. George's and not on a direct bus route. You can however walk to the beach from Kings Square (the town center of St. George). The bay here is known as the Gates Bay. This is the historic beach where the Sir George Somers and his men came ashore after being shipwrecked at a nearby reef in 1609. 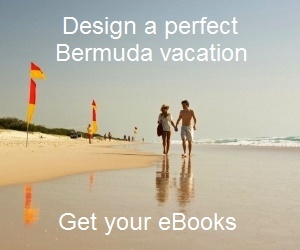 And that was the beginning of human settlement in Bermuda. At one end of the beach you can see the St. Catherine's Fort at a distance towards north. If you are coming to Bermuda by air, look through the window when your are landing. You can see this wonderful beach from the aircraft. 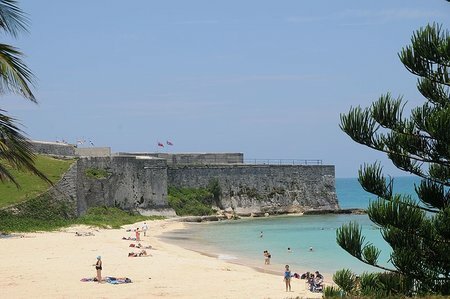 Achille's bay beach is located on the other side of St. Catherine's Fort. That beach has all facilities. So if you are looking for food, drinks, renting chairs etc, go down to the other side. The restaurant The Beach House is located right above Achille's Bay beach. The view of sunset from the restaurant is awesome (probably one of the best you get to see in Bermuda). The beach is quite popular with locals. You can often find some locals fishing from a jetty at the beach. The water is calm and the beach is great for swimming. You can also snorkel and see some small fish, but Tobacco bay beach located nearby is far better when it comes to snorkeling. There is a make shift toilet on the beach, but no changing or showering facilities. Update February 2015: There used to be a snack bar at St. Catherine beach and also water sport facilities (like banana boating etc). The snack bar and facilities have been removed in 2011 because a new hotel would come up in nearby area. The hotel development project however has been delayed since 2011... cancellation of contracts and new government forming caused such delays. As of now, the hotel development project is likely to start in mid-2015. Update June 2015: You can now rent chairs at St. Catherine beach. St. Catherine's beach is located north east of the town of St George and is not on a major bus route. If you don’t have a scooter, you can catch a bus (#1, 3, 10 or 11) from Hamilton to St George and then take a minibus service to the beach. The mini buses depart from King’s Square. They operate all time of the day during summer. You can buy minibus tickets from the Visitors Information Center at Kings Square, St. George. From Kings Square, you can also walk up to the beach (about 25 minutes). It's an uphill walk and can be a bit tiring for some. From Kings Square take Duke of York Street, take a left at Somers Super Market towards Duke of Kent Street. Keep going and you will reach Tobacco Bay. St. Catherine's beach is further 5 minutes walk from there. Can I get an update on the status of St. Catherine Beach. The beach is still quiet and without any facilities other than a make-shift toilet. The new hotel development work is scheduled to begin in mid 2015. So the beach is likely to be spared until then or even beyond if the hotel project gets further delayed.